When we realized that we had eleven chickens instead of ten, we joked that all of our problems were the fault of that 11th duckling. As it turns out, we weren't entirely wrong. 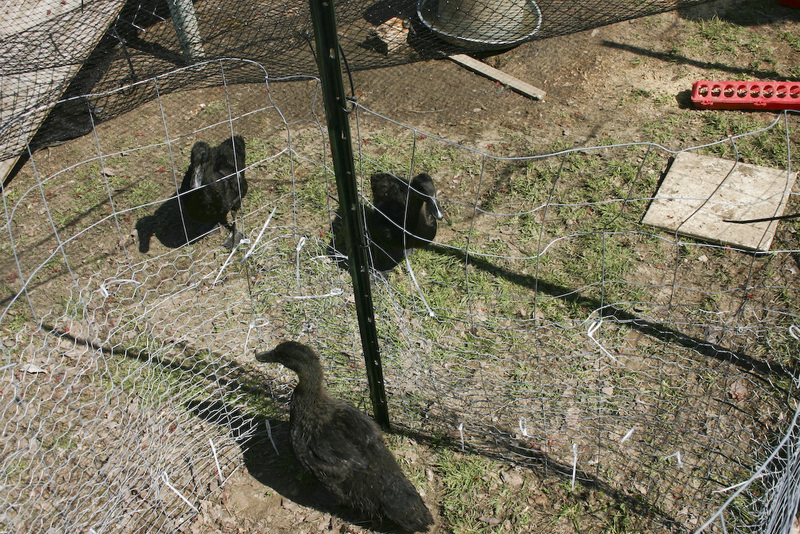 After the ducklings had been outside a few days, I noticed that their feathers were coming in, and then disappearing. There were a lot of squawks out there as ducks had their feathers pulled. 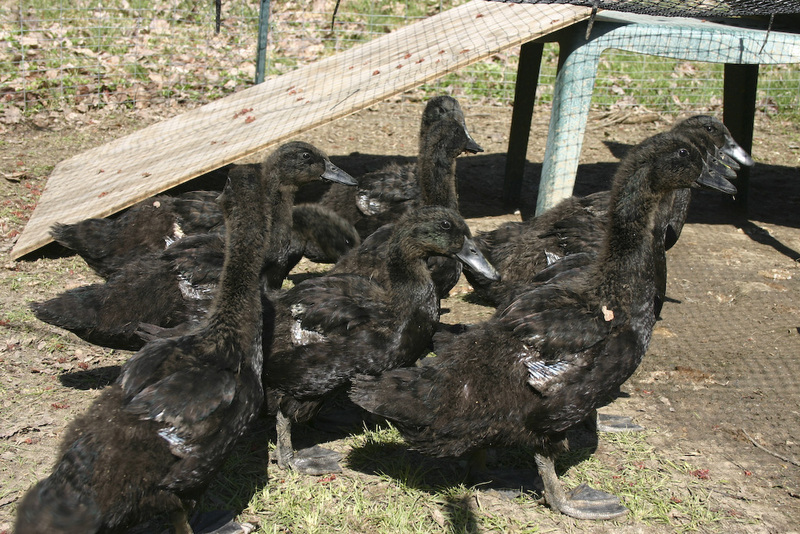 At first, it looked like nearly every duck had damage. Looking through the duck books, it seemed I had the mysterious "feather cannibalism", which had kind of mysterious causes - diet? stress? close confinement? - and no clear cures except trimming bills, which I'm nowhere near capable of doing. After a few days of observation and panic, though, it became clear that one duck had nearly all of his feathers. I also saw that same duck attacking lots of other ducks. This morning while I was setting out their water and food, I saw him attack five ducklings. Over the weekend, I'd pulled that duck out to look at him. I know - never name the livestock. 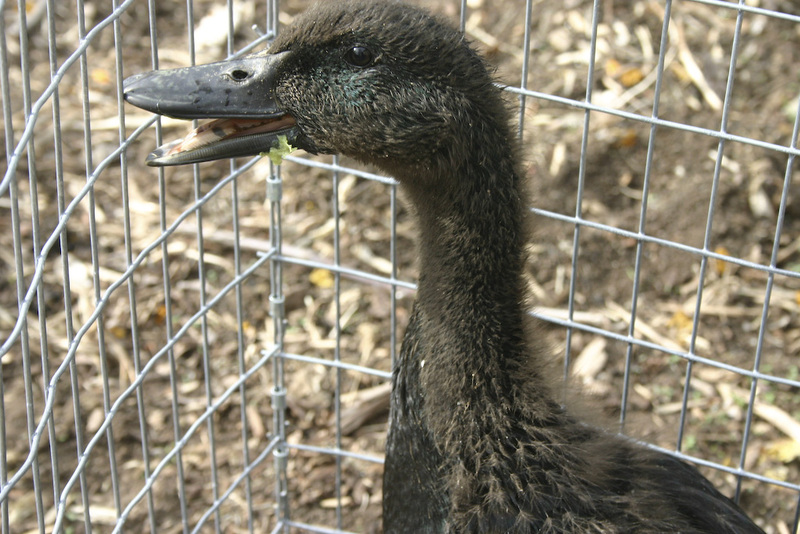 We'd planned to slaughter and eat ducks based on personality - mean ducks first. Unfortunately, he's only four weeks old, so small and covered with largely unpluckable feathers. That wasn't a great option, for now. So, today I built a separate little cage in a corner of the main cage, using the same fencing plus chickenwire to make sure he can't escape into the main area. 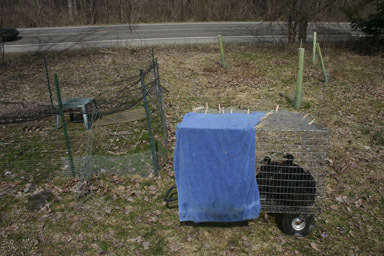 Darth has food, water, the heating block from the chickens' water, and no one but himself to blame. So far, the results are promising. He can't bite at his fellow ducks, and he doesn't whine like he did when I took him far away. He would clearly prefer to be in the main cage, but he can't be. I've heard much less pained squawking from the ducks, though I wonder if another duck will rise up in Darth's place. One thing that's funny - the other ducks come over to visit him. They never spent much time in that corner of the cage until today. We'll see how it goes. I'm hoping that isolating the worst perpetrator will at least give the other ducks a chance to grow their feathers back and generally heal from their wounds. I don't think Darth was the only one doing it, and I'll be keeping an eye on the rest. I definitely don't want to have to build eleven little cages in there. An hour a day in the garden has kind of turned into an hour a day with ducklings. Hopefully this will settle down soon. 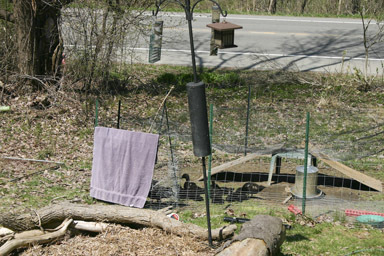 On the bright side, the ducklings have gotten to spend more time outside while I'm cleaning. They're using the pen the chickens had last summer, and I'm planning to build them a box to stay warm in at night, since they haven't feathered out yet. The next week looks like it'll be plenty warm for them, and hopefully these temperatures will last. I don't think they love being in a 3' x 4' cage, either. I've also posted a gallery of more, including photos too gross to put on the main page. 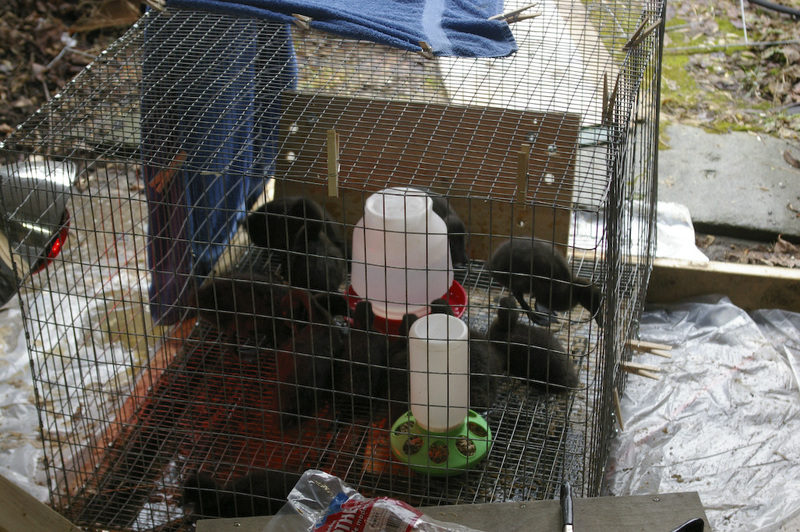 When I'm not helping with Sungiva, I'm trying to keep up with our chicks and ducklings. I think I may have overreached in ordering the ducklings. 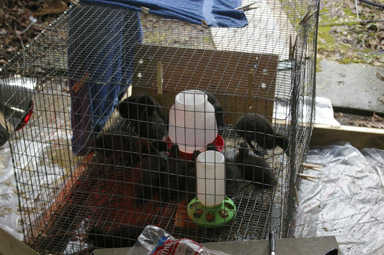 I'd like to blame my problems on the week I lost to the flu and my lingering exhaustion, but mostly I don't think I had a clear idea of how much harder it is to brood ducklings than chickens. 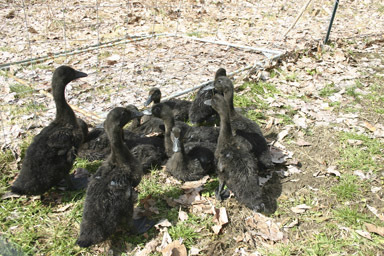 The main problem is simply water: ducklings use an incredible amount of it, and it ends up making a mess. We've moved the brooder box downstairs twice, first from an emptyish but very nice room to a tighter room but one whose floors we didn't mind getting wet, and then down into the basement. We've had dropcloths underneath the brooder box the whole way along to protect the floor, and newpaper and cardboard to collect water and droppings, but Tuesday I finally concluded that that wasn't going to work. I'd been planning on building another brooder box like the one I had made last year for the chickens, but that would have left me with the same mess problem. Instead, I borrowed one of the cages Angelika had built for rabbits, ran out to get a plastic pan to go under it, and moved the ducklings into the cage. Sprocket guards the ducklings outside. It was a nice day, so I was able to do most of this outside, fortunately. Our neighbor's daughter got to come over and meet the ducklings and the chicks, which was a nice bonus, and Sprocket chased the ducklings around and around in their cage. Ducklings in the basement, by the open garage door. The ducklings and the chicks are now in the basement. The ducklings had been able to do without a heat lamp upstairs, hiding in the cooler end of the brooder box, but they definitely like the light in the basement, cuddling together in front of it. The chicks are about the same as they were, still definitely fond of the heat lamp. The challenge, of course, is emptying the plastic tray under the ducklings. 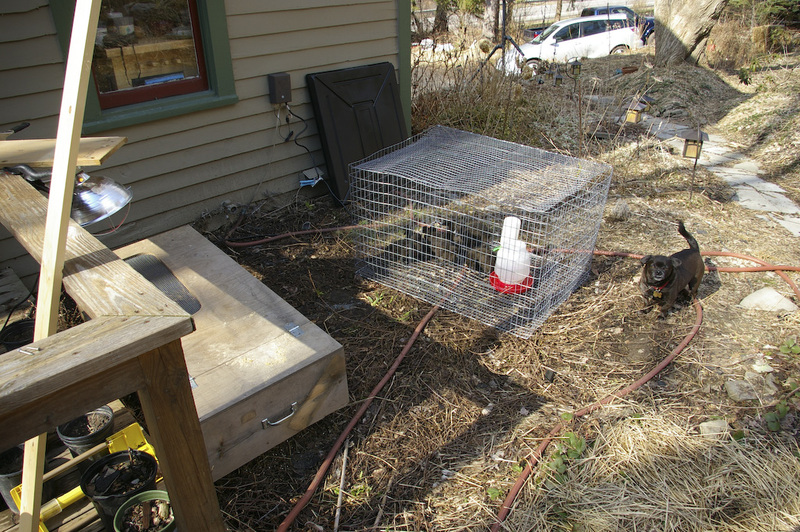 Between the amount of stuff in the basement and some strange slopes in the concrete floor, I have to move the duckling cage - which gets heavier as the ducklings grow - and then lift the tray, pouring it into a five-gallon bucket which then goes to the compost bin. Yuck. Today I'd let it fill too much, which made it just barely possible to put in the bucket and remove. It's a big tray - 36" x 30" - and it doesn't take much water to make it very heavy. And of course it's slimy. Being prepared for a mess. 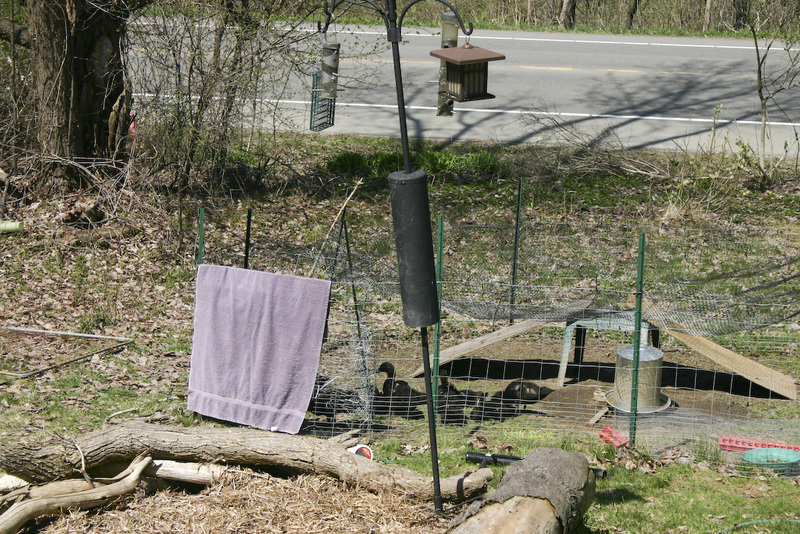 The chickens are much much easier, even now that we have 18 of them, as opposed to last year's six. The ducklings I got were 'straight run', so I'm hoping that they'll form a happy reproducing flock, and I won't ever need to do this style of brooding again. 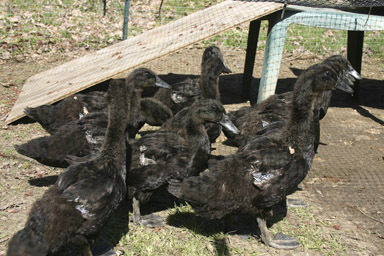 For genetic variety, maybe I'll be able to buy an occasional Cayuga adult and add it to the flock.